OAKLAND — A jury Monday deadlocked on assault charges against three men who once were members of Your Black Muslim Bakery and acquitted a fourth, ending a two-week trial with no convictions. 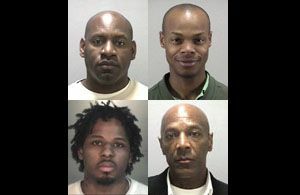 Jurors told Superior Court Judge Jeffrey Horner that they could not reach verdicts against Dahood Bey and Basheer Muhammad, who were accused of leading an attack Dec. 21, 2008, against a man who rented a room from Bey. Bey also was charged with torture. Ajuwon Muhammad, the third defendant, was acquitted on a robbery charge; jurors said they could not agree on an assault charge against him. The fourth defendant, Jibrial Muhammad, Ajuwon’s brother, was acquitted of assault, the only charge he faced. Ajuwon Muhammad was returned to jail because of a probation violation. Bey and Basheer Muhammad remain free on bail. The three are scheduled to appear in court March 1, when a second trial could be scheduled. The jury of six men and six women began deliberations Thursday morning. Its foreman told Horner on Monday afternoon that the panel was hopelessly deadlocked on a majority of the charges. Prosecutor Patrick Moriarty left court without commenting. Defense lawyers also would not discuss the case, citing the judge’s order not to do so. The defendants were charged with beating a man on Bey’s orders Dec. 31, 2008, at a house in East Oakland. The victim testified that as many as 12 men took part in the assault. He suffered four broken ribs, a badly swollen eye and other injuries. Defense lawyers repeatedly had challenged the credibility of the victim, saying he had started a fight with Bey and Basheer Muhammad, lost it and invented a story out of ego and a hope that he could qualify for victim compensation funds to pay his medical bills. They pointed out that he had once knocked out a Pittsburg police officer with a single punch and had hit a pregnant woman in a dispute over a parking place. Michael Cordoza, Bey’s lawyer, told the jury in his closing argument that there was a lack of evidence in the case. Joseph Penrod, a public defender who represented Basheer Muhammad, called the victim a “very cunning” man adept at manipulating people. Moriarty argued that Bey was the captain of a paramilitary organization modeled on the Nation of Islam’s Fruit of Islam. Bey ordered the attack because the victim had disrespected one of his men who lived in the house and threatened to kill him, the prosecutor said. Bey was a spiritually adopted son of late bakery founder Yusuf Bey. Basheer Muhammad was one of Yusuf Bey’s lieutenants. The victim, whom Moriarity asked not be identified because he fears for his life, testified that he is a member of the Nation of Islam. Dahood Bey is the leader of a separate, local Black Muslim sect, as was Yusuf Bey. Ajuwon Muhammad, Basheer Muhammad’s son, was a follower of the bakery’s last leader, Yusuf Bey IV, and is his co-defendant in a fraud case involving fake identifications that were used to purchase luxury automobiles. He was also charged in a San Jose gun case, when officers said they saw him toss a 9 mm handgun out a car window. He skipped bail and was later arrested in St. Louis. It was unclear Monday how the gun case was resolved. Jibrial Muhammad, the defendant acquitted of a single assault charge Monday, was not present during the suspected attack on the victim, his attorney told the jury. The victim had said he saw him after the suspected attack and later picked his photograph out of several shown to him by police. Bey IV is jailed without bail on three murder charges, including on charges of ordering the 2007 killing of journalist Chauncey Bailey and two other men in 2007. In a separate case, he also is charged with kidnapping and torture. His murder trial is scheduled to begin in May. Your article about the bakery members No convictions assault case was very confusing. All throughout the article you were referring to Bey this and Bey that, given the fact that there are many Beys, as a writer shouldn’t you be more specific. Its obvious this article has nothing to do with Yusuf Bey IV but it seems to me that was what you wanted people to think when reading your article. All I am asking is for reliable news. Because to be honest as a member of the community, I do not take anything you all publish as accurate, everything seems to be one sided and to benefit your own agenda.